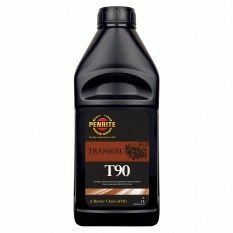 Penrite Transoil 90 is a 'straight' or non-additive treated gear oil suitable for use in either straight bevel, spiral bevel or worm gears. The choice of viscosity is very much affected by individual design requirements. For most gearboxes, the lighter the oil, the easier the gear change. Transoil 90 is suitable for gearboxes and rear axles of small and medium sized vehicles from the 1920's and 1930's. Ideal for vintage, veteran and classic gearboxes and overdrives that recommend SAE40 or SAE50 oils. Recommended also for Luvax shock absorbers . Compatible with leather and synthetic rubber seals.